Colette Russell Smith is the co-founder of Savoursmiths, a premium crisp brand whose tasty nibbles are stocked in Harrods and Harvey Nichols. Here, she tells us about infusing snacks with luxurious flavours and why lemongrass might not be featuring in her crisps any time soon. How did your crisp business start, Colette? My husband Mike is a third-generation potato farmer whose family has been farming potatoes for over 100 years. When we moved back to the family farm near the Imperial War Museum not far from Cambridge in the UK, we were looking for a business idea that we could work on together. I had been studying business management, Mike had been in wealth management, and we thought about all sorts of things that we could launch. We’re both very foodie and we’re into entertaining, and as we love provenance when it comes to food, we thought it would be nice to make use of something that we grow on the farm. So crisps was an easy choice? We’d been going backwards and forwards mulling over different ideas and then one night we were like, ‘Hang on a second — why don’t we start a crisp company?’ We knew it was going to be a very competitive industry to get into, but we felt if we were going to do it we would do a really premium product with really good quality ingredients and try and make the poshest of posh crisps ever. We also wanted to have a bit of fun with it, doing really exciting flavours that no one has done before. Truffle and rosemary, Wagyu beef with honey and English mustard, Champagne and Serrano chilli, parmesan and port. They’re the four flavours that we launched with just over two years ago, and we also have a desert salt flavour, which uses crystal white desert salt sourced in the Kalahari Desert. We had no idea what to do because neither of us had any experience, so it was quite a learning curve. We read a lot of books and reports and went to food fairs and we found some people to help us with everything from making the crisps to packaging, distribution and marketing. There were definitely some nights in our kitchen where we were standing round a hot fryer testing out some flavouring in little sachets that we’d had made on a batch of crisps we’d cooked ourselves. We played around with lots of different flavours. 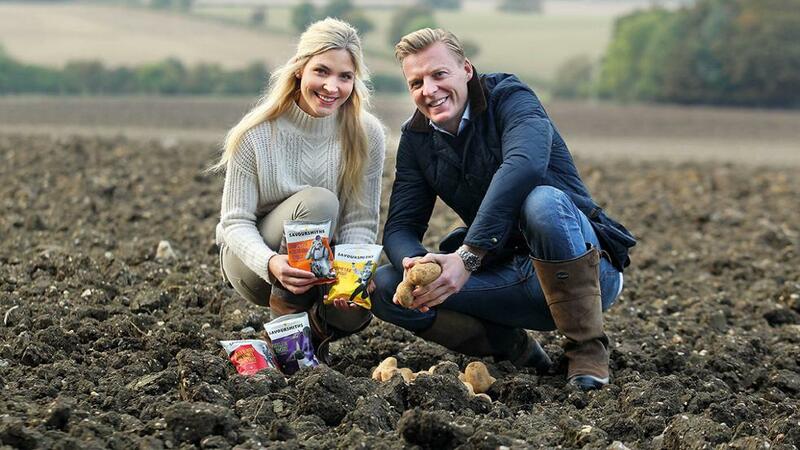 Do you think these are the poshest crisps in the world? Oh, for sure! We try. There are a lot of posh crisps out there but we really do put a lot of care into what we do and we buy really expensive flavourings because of the quality of ingredients that go into them. How vital are the potatoes that you choose? Very. We really care about the environment on the farm and we grow everything to a really high standard here: you don’t use the same ones that you would use for mashing, though. We use three varieties that we grow and they’re all great for frying. In the UK, we’re available at Fortnum and Mason, Waitrose, Harrods and Harvey Nichols, and we’re increasingly exporting overseas: I think we’re at 18 countries now. We hope to launch in the UAE very soon because we were just at the SIAL food fair in Paris and we met a lot of interesting people there. I think the desert salt flavour could do really well in the UAE — and there might be another flavour in the pipeline that could work there, too. We’re looking at something very exciting that works for a lot of different cultures. How do you come up with new flavours? It usually starts at our kitchen table chatting about what could work — we like to think that our brand is a reflection of who we are as people and what we’re into. When we have an idea, we work with our flavouring house and we talk to them about our ideas to see what they can come up with and see if the variations of flavours we suggest work well together and balance well. There’s a lot of research into what we think might work, too. Have you ever come up with an idea that tasted pretty horrible? Oh sure, it doesn’t always work out as you’d imagined. We’ve tried quite a few and it was a case of, ‘Oh, no, no, no!’ when we tried it. You don’t always get what you’re expecting — something like lemongrass can taste quite soapy, for example. How can we make a decent crisp at home? You need a good frying potato — we use Lady Claire, Lady Rosetta and Lady Amarilla. Cut them up very thinly with a sharp knife, soak them in salted water for about half an hour, rinse them and then put them in a hot fryer until they’re golden and then lift them out onto kitchen paper to drain. Flavour them while they are still hot. Sprinkle on some salt, or you could try some spices or herbs instead. Finally, if you had to choose a more run-of-the mill flavour, what would it be? I think I would go for black pepper.